We are available for custom mosaic work in residential, commercial and community spaces. Our services include working with a client to create a design for indoor or outdoor applications, fabrication and installation of mosaic creations. We have custom tile experience in bathrooms, showers, kitchen counter tops and backsplash areas and living area floors. Our custom mosaic experience ranges from small pieces to larger pieces, including public art projects. Our latest public art project was the design, creation and installation of a 98 square foot mosaic sun at the entrance of the Hemet Valley Mall in Hemet, California. 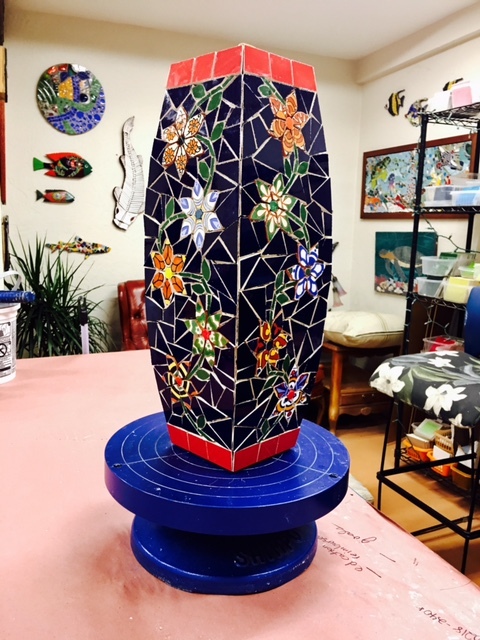 It’s been a very busy few weeks, but we wanted to say THANK YOU for your dedication and attention in creating that beautiful mosaic tile vase for Jana. Everyone was impressed with your artwork and how beautiful the finished vase looked! Also, everything seemed to fall perfectly in place (and I don’t just mean the mosaic tiles!). From the moment we first consulted with you to the completion of the vase, everything went so smoothly. We first thought we did not have time to have anything like this completed in time for Jana’s retirement celebration, but you quickly established your timeframe and got to work! We are forever grateful for your intuition and support. Thank you for the business cards and workshop advertisements. Don’t be surprised if you get requests to attend a workshop! Contact us to discuss a project. We love what we do and look forward to helping you create your own piece of mosaic heaven!